Five grey limestone plaques inscribed, respectively, with the names of Zeus Megistos, Apollo, Helios, Artemis, Athena Basileia. 'Frātarakā (or Frātadarā) Temple'. Pārseh (Persepolis), Fārs province, Iran. Late fourth or beginning of third century BC. Excavations of E. Herzfeld (Oriental Institute of the University of Chicago), 1932. At least three of the plaques are conserved in The National Museum of Iran, BK 291 (inscr. Ἀπόλ[λωνος]), BK 292 (inscr. Ἡλίου), BK 293 (inscr. Διὸς Μεγίστου). H. 0.14-0.15 m, W. 0.155-0.35 m, Th. 0.075-0.12(?) m.
Ancient texts after Rougemont, G. 2012. Inscriptions grecques d'Iran et d'Asie centrale, avec des contributions de Paul Bernard. Corpus Inscriptionum Iranicarum, part II, vol. I.1. London: nos. 59-63. Reproduced by permission of Georges Rougemont and the Corpus Inscriptionum Iranicarum. The five plaques were included among the finds of Ernst Herzfeld's excavation at the so-called Frātarakā (or Frātadarā) Temple, located some 300 m northwest of the Persepolis terrace, but the exact find spot is not recorded (Anonymous 1934: 232; Herzfeld 1935: 44, 46; Schmidt 1953: 53 with n. 14, 56). 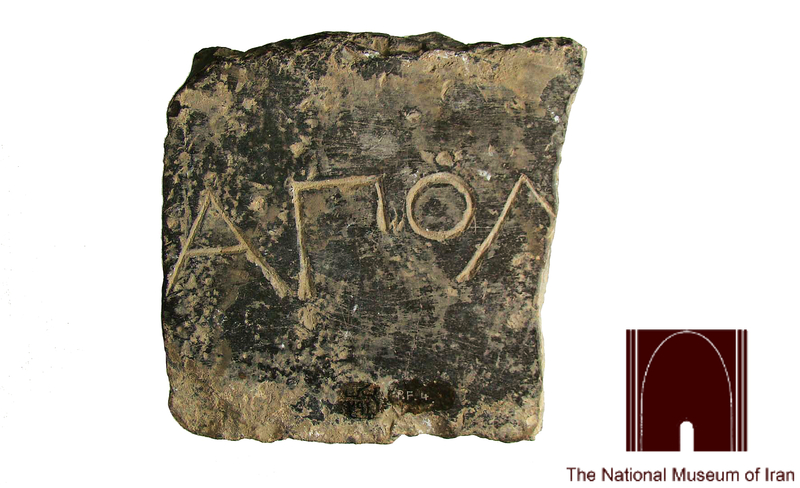 Following an initial publication of photographs of three of the plaques by Georges Rougemont in 1999, some sixty-five years after their discovery, the group was fully illustrated for the first time in this same scholar's recent epigraphic corpus (2012: nos. 59-63; earlier commentaries in Robert 1967: 282 with n. 1, Canali De Rossi 2004: nos. 241-245, Merkelbach and Stauber 2005: no. 309). The homogeneous Greek script of the texts is datable to the late fourth or the early third century BC (Robert 1958: 9 n. 2). It thus broadly sets the carving of the plaques to sometime during the rule of Persis by Alexander III (331-323 BC), or during the office of his appointed stratēgos of this region Peucestas (323-315 BC), or under Seleucus I (after 311 BC). At least two of the plaques, presently conserved in the National Museum of Iran, were fashioned from architectural elements of the Achaemenid period (Shahrokh Razmjou apud Callieri 2007: 56). To judge by their rough reverse faces, the plaques were likely meant to be inset, but the material (stone? brickwork?, see Callieri 2007: 66) and the nature of the support remain uncertain. Herzfeld (1935: 44) proposed that we are dealing with 'votive inscriptions, whether from statues or altars'. For Louis Robert (1967: 282), the genitive case of the divine names would be appropriate for altar inscriptions. According to Helmut Waldmann (1991: 149; but see Litvinskij and Pičikjan 2000: 233-234, for contrary arguments), the plaques could be associated, respectively, with five statues that supposedly stood originally on the five limestone bases discovered in situ in Room 5 of the building occupying the northwestern part of the site (the 'Pedestal Temple' of Stronach 1985; see also Callieri 2007: fig. 26, pp. 51-67 for a recent discussion of the architectural remains at the site and bibliography). The implications of the find concerning the circumstances of a Greek presence locally have been variously interpreted. Even though they are still inadequately understood (Schmidt 1953: 56; Boucharlat 1984: 131-132; Callieri 2003; Boucharlat 2006: 452-453; Callieri 2007: 51-66; Mousavi 2012: 73-77), the ruins of the so-called Frātarakā Temple attest to both Greek and Iranian cultural traits and imply a locale of dialogue between the Greek and Iranian cultures. An architectural relief of undoubted Iranian cultic character and supposed post-Achaemenid date found in the southeastern edifice of the site (the 'Window Temple' of Stronach 1985) was important in shaping Herzfeld's opinion that the excavated remains ought to be associated with the native dynasts (the frātarakā) of Persis, who rose to power during or after the period of Seleucid rule over this region (for the uncertain chronology of these dynasts, see, e.g., Alram 1986: 162-163; Wiesehöfer 2007: 40, 44-47; Sarkhosh Curtis 2010). Accordingly, Herzfeld conjectured that, under the guise of Greek divine names, the inscriptions on the plaques referred to Iranian gods, with Zeus standing for Ahuramazdā, Athena and Artemis for Anāhitā, and Helios and Apollo for Mithra. In his opinion, furthermore, assimilation of Greek theonyms in this instance would reflect the substantial Greek impact —an impact occasioned by Alexander's establishment of a Greek-Macedonian regime in Fārs— upon Iranian religious expressions (Anonymous 1934: 226; Herzfeld 1935: 44; idem 1941: 275-276). Herzfeld's narrow interpretation of the plaques with reference to Iranian cultic practice remains without concrete corroboration to date (Bernard 1969: 337 n. 1; Ghirshman 1976: vol. 1, 201-202; Boyce and Grenet 1991: 107). The extant remains do not preclude construction and religious activity at the site under Greek-Macedonian rule — and indeed since the Achaemenid era (e.g., Boucharlat 1984: 131-132; Stronach 1985: 612-617; Razmjou and Roaf 2013: 413-414). 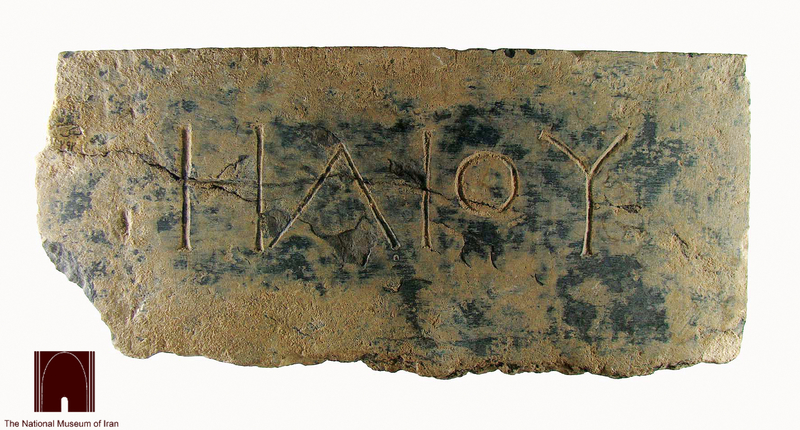 It is always likely, therefore, that the plaques were associated originally with a Greek-Macedonian context, and this possibility could be supported by the written record. As Josef Wiesehöfer (1994: 77-79; idem 2007: 39; cf. earlier Ghirshman 1976: vol. I, 201, and Stronach 1985: 614) argued, the plaques could belong to the 'altars of gods' which, together with altars of Alexander and Philip, occupied a central place in a magnificent sacrificial feast given for Greek and Iranian constituencies at Persepolis by Peucestas in 317 BC (Diod. 19.22.3: βωμοὶ θεῶν καὶ Ἀλεξάνδρου καὶ Φιλίππου [Alexander IV and Philip Arrhidaeus?]). Said to have hosted both Greek and Iranian contingents, the banquet described by Diodorus (19.22.1-3) also apparently combined Greek elements with aspects of earlier Achaemenid protocol and ceremony (e.g., Calmeyer 1982: 185-186; Boyce and Grenet 1991: 19-20, speaking of 'an act of shared worship by Hellenes and Iranians'; Wiesehöfer 1991: 130; idem 1994: 53-54; Briant 1996: 258-259, 323). Even more notably, it admits comparison with a ritual feast (El. šip) that was profoundly connected with Achaemenid royalty (Henkelman 2011: esp. 115-118). 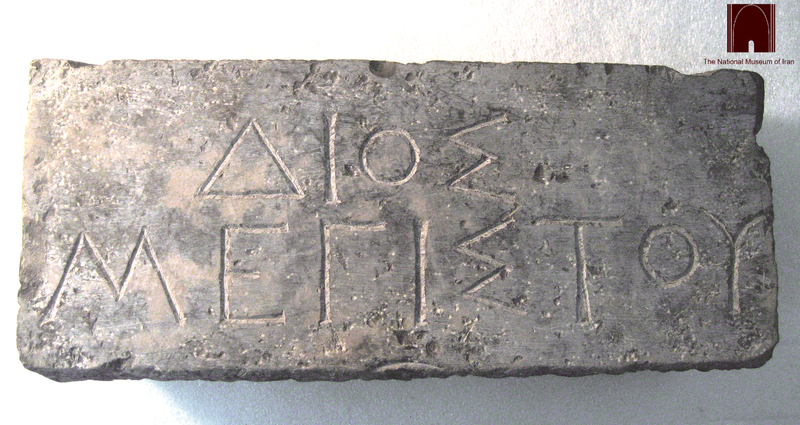 If, as Wiesehöfer suggested, the plaques derived from the 'altars of gods' featured in Peucestas' banquet, these inscribed documents would have originally formed a part of the complex dialogue between the Greek-Macedonian and earlier Achaemenid dynastic worldviews which is attested in this instance by Diodorus. Alram, M. 1986. Nomina propria Iranica in nummis. Materialgrundlagen zu den iranischen Personennamen auf antiken Münzen. Iranisches Personennamenbuch IV. Vienna. Anonymous 1934. 'Recent discoveries at Persepolis.' Journal of the Royal Asiatic Society: 226-232. Bernard, P. 1969. 'Quatrième campagne de fouilles à Aï Khanoum (Bactriane).' Comptes rendus des séances de l'Académie des Inscriptions et Belles-Lettres: 313-355. Boucharlat, R. 1984. 'Monuments religieux de la Perse achéménide, état des questions.' In Roux, G. (ed. ), Temples et sanctuaires. Séminaire de recherche 1981-1983. Travaux de la Maison de l'Orient. Lyon: 119-135. ——. 2006. 'Le destin des résidences et sites perses d'Iran dans la seconde moitié du IVe siècle avant J.-C.' In Briant, P. and Joannès, F. (eds. ), La transition entre l'empire achéménide et les royaumes hellénistiques (vers 350-300 avant J.-C.), actes du colloque organisé au Collège de France par la ‘Chaire d’histoire et civilisation du monde achéménide et de l’empire d’Alexandre’ et le ‘Réseau international d’études et de recherches achéménides’ (GDR 2538 CNRS), 22-23 novembre 2004. Persika 9. Paris: 443-470. Briant, P. 1996. Histoire de l'empire perse. De Cyrus à Alexandre. Paris. Callieri, P. 2003. 'Some notes on the so-called temple of the Fratarakas at Persepolis.' In Fontana, M. V. and Genito, B. (eds. ), Studi in onore di Umberto Scerrato; per il suo settantacinquesimo compleanno. Napoli: 153-165. Calmeyer, P. 1982. 'Zur Genese altiranischer Motive. VIII. Die “statistische Landkarte” des Perserreiches 1.' Archäologische Mitteilungen aus Iran 15: 105-187. Ghirshman, R. 1976. Terrasses sacrées de Bard-è Néchandeh et Masjid-i-Solaiman, 2 vols. Mémoires de la Délégation archéologique en Iran XLV. Paris. Henkelman, W. F. M. 2011. 'Parnakka’s feast: šip in Parsa and Elam.' In Álvarez-Mon, J. and Garrison, M. B. (eds. ), Elam and Persia. Winona Lake: 89-166. Litvinskij, B. A. and Pičikjan, I. R. 2000. Ellinističeskij xram Oksa v Baktrii (Južnyj Tadžikistan), vol. I: Raskopki Arxitektura. Religioznaja žizn'. Moscow. Mousavi, A. 2012. Persepolis. Discovery and Afterlife of a World Wonder. Boston and Berlin. Razmjou, S. and Roaf, M. 2013. 'Temples and sacred places in Persepolis.' In Kaniuth, K., Löhnert, A., Miller, J. L., Otto, A., Roaf, M. and Sallaberger, W. (eds. ), Tempel im Alten Orient, 7. Internationales Colloquium der Deutschen Orient-Gesellschaft 11.- 13. Oktober 2009, München. Colloquien der Deutschen Orient-Gesellschaft Band 7. Wiesbaden: 407-425. Robert, L. 1958. 'Observations sur l'inscription grecque.' Journal asiatique CCXLVI: 7-18. Rougemont, G. 1999. 'Les inscriptions grecques d'Iran.' In Empires perses d'Alexandre aux Sassanides. Dossiers d'Archéologie no. 243. Dijon: 6-7. ——. 2012. Inscriptions grecques d'Iran et d'Asie centrale, avec des contributions de Paul Bernard. Corpus Inscriptionum Iranicarum, part II, vol. I.1. London. Sarkhosh Curtis, V. 2010. 'The Frataraka coins of Persis: bridging the gap between Achaemenid and Sasanian Persia.' In Curtis, J. and Simpson, St J. (eds. ), The World of Achaemenid Persia. History, Art and Society in Iran and the Ancient Near East, proceedings of a conference at the British Museum 29th September - 1st October 2005. London: 379-394. Stronach, D. 1985. 'On the evolution of the early Iranian fire temple.' In Bailey, H. W., Bivar, A. D. H., Duchesne-Guillemin, J. and Hinnells, J. R. (eds. ), Papers in Honour of Professor Mary Boyce, vol. 2. Acta Iranica 25. Hommages et Opera Minora 11. Leiden: 605-627. Waldmann, H. 1991. Der kommagenische Mazdaismus. Istanbuler Mitteilungen, Beiheft 37. Tübingen. Wiesehöfer, J. 1991. ‘Beobachtungen zu den religiösen Verhältnissen in der Persis in frühhellenistischer Zeit.’ In Kellens, J. (ed. ), La religion iranienne à l'époque achéménide, actes du colloque de Liège, 11 décembre 1987. Iranica antiqua, Supplément 5. Gent: 129-135. ——. 1994. Die 'dunklen Jahrhunderte' der Persis. Zetemata 90. Munich. ——. 2007. 'Fars under Seleucid and Parthian rule.' In Sarkhosh Curtis, V. and Stewart, S. (eds. ), The Idea of Iran, vol. II: The Parthian Age. London and New York: 37–47.